Hunting games are something I play every year. 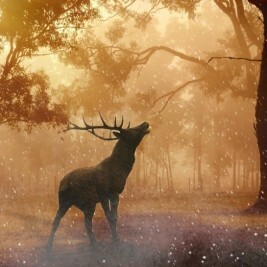 Its me versus the wild elk, deer and other big game in God’s majestic creation. This October the stakes are higher, but so are the odds of success. All of my elk hunting has been DIY on public land and I’ve been blessed to come out on top most of the time. 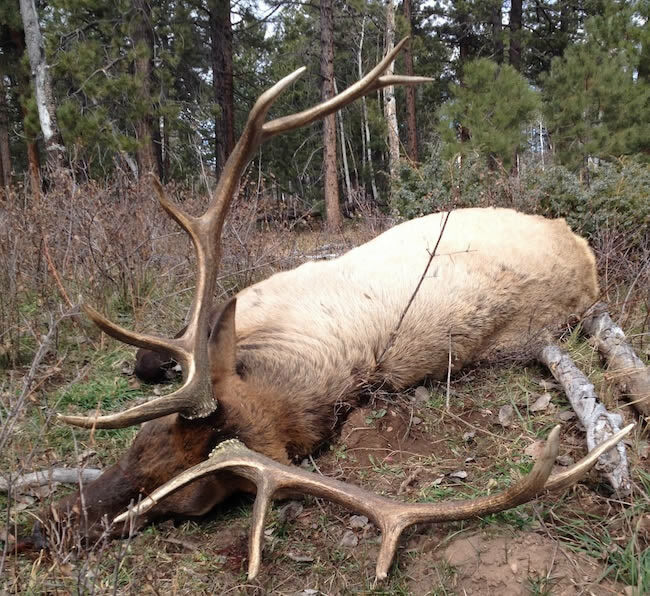 But, the elusive bull elk seems to dominate in the win loss column. I’ve hunted elk for 10 years in Colorado and this is by far the best bull elk hunting opportunity I’ve ever had this state. I was drawn for an elk bull tag in the Uncompahgre National Forest, unit 61. 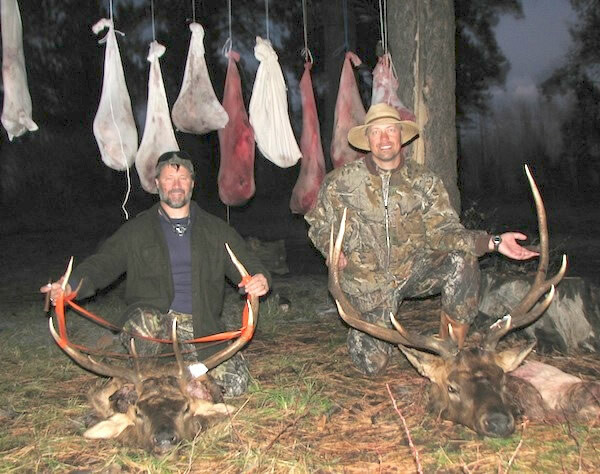 At a minimum, it takes 7 years to have the opportunity to hunt a bull elk with a rifle in this area because of the Colorado lottery system (preference points). This hunting trip is also special because I am dedicating it to my grandpa, Papa Tooter, Mr. E.C. Fish, who passed away in April. 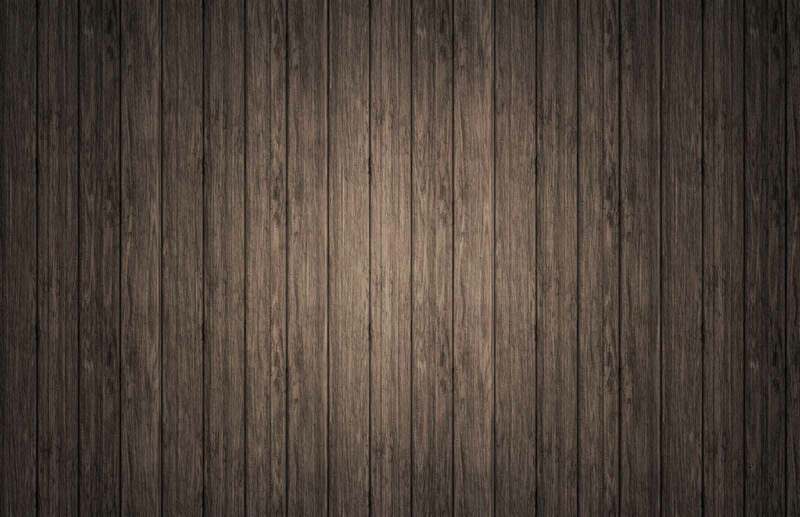 He gave me my first rifle and was the most influential man in my life. He taught me to hunt, fish, and be responsible, caring person. Read more about about him and his influence on me. I’ll be going with my long-time friend, fellow Texan, and Christian brother, Jimmy Pruett. This guy is a real “mans man” and wilderness backpacking maniac. 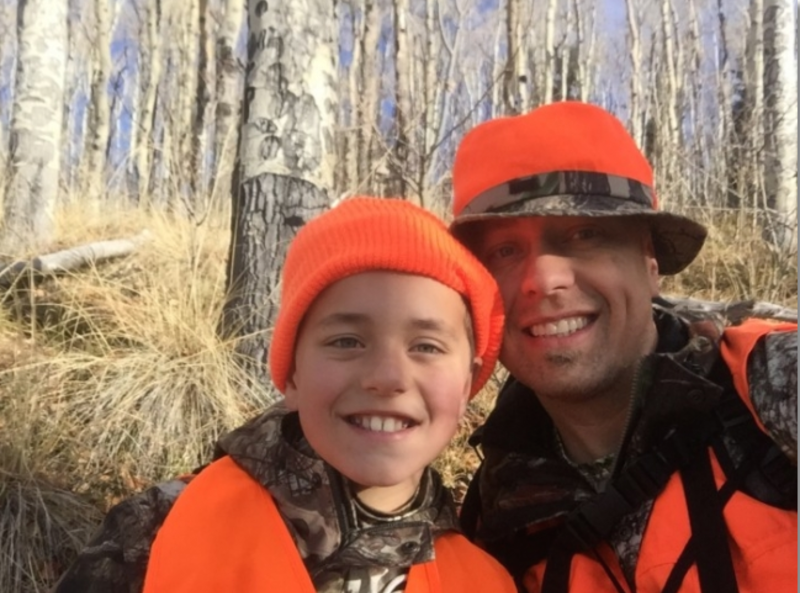 Jimmy is also dedicating this hunting trip to his dad, who also passed away this year. I am very blessed to get to hunt with such a good friend. Learn more about Jimmy at the bottom of the page. The Uncompahgre National Forest, unit 61 is in SW Colorado, just south of Grand Junction. It is about 7 hours from Colorado Springs (with the camper and all needed stops). We leave Oct. 18 at 3 a.m. and can hunt until Oct. 27. Oddly enough, this location has spots with internet access, so I plan to post updates on Facebook, Twitter and Intagram. My preparation for this trip has been very extensive. Extensive research to select the best elk unit with 7 preference points. 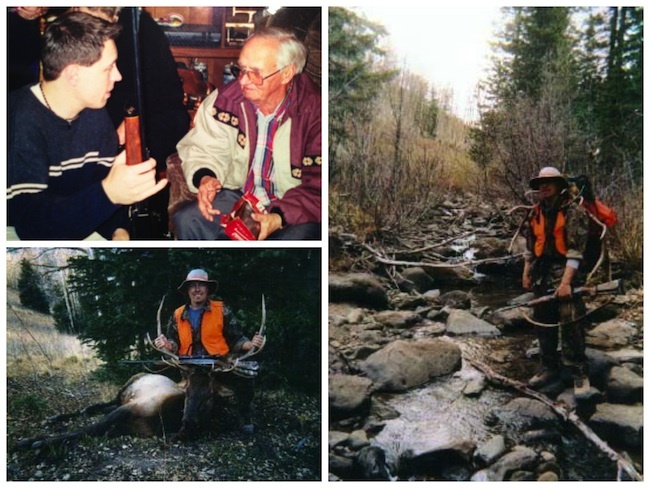 I interviewed hunters, Colorado DOW staff and an independent hunting consultant. I also reviewed harvest statistics for my particular species and season. I spent countless hours investigating and being active in hunting forums. I gathered nearly 20 specific locations that folks had located elk. I scoured the web and was connected with two bloggers that had hunted in Unit 61. I sent them emails and they were gracious enough to respond. I also was able to network and locate two others locally that had hunted the area. They were also very helpful. Never underestimate that other hunters are usually open to helping fellow hunters, especially when your talking about a unit you can only hunt every 7 years. Once I narrowed it down to 6-10 areas, I spent the rest of my time studying maps like, HuntingGPSmaps, Google Maps, National Geographic (print and TOPO), Colorado DOW Hunting Atlas (winter/summer ranges – migration paths), Startmyhunt.com, and Garmin BaseCamp. On each map I assessed access points, trails, private land, boundaries, water, dark timber vs aspen, saddles, campgrounds, canyons, and most importantly, how to places no one else would want to hike to. Jimmy and I scouted unit 61 once this year in mid July. We had two full days in the area. After traveling for over 320 miles to get there, we drove nearly 100 miles around the area locating roads, trails and various access points. We then hiked about 9-12 miles each day, trying to learn as much as possible. In two of the areas we counted over 30 rubs and saw a lot of elk sign. We saw nearly every form of wildlife, deer, coyote, grouse, and turkey. We didn’t see a bear, but we saw tons of sign. After scouting we identified our top two areas we want to start with. We plan on staying in my camper, but we are also bringing all our gear to backpack in if needed. Weather can play a big role so we are staying flexible. Because of all of our research and scouting we have several options. We do not have four wheelers, but we do have a 4×4 SUV and plan on hiking long and hard. Unit 61 is beautiful, rugged, and vast. It is unlike any area I have ever hunted. You are on top of a large plateau and everything is pretty much down hill…but you always have to come back up. There is a lot more scrub oak than I expected with tons of aspen and some dark timber mixed in. 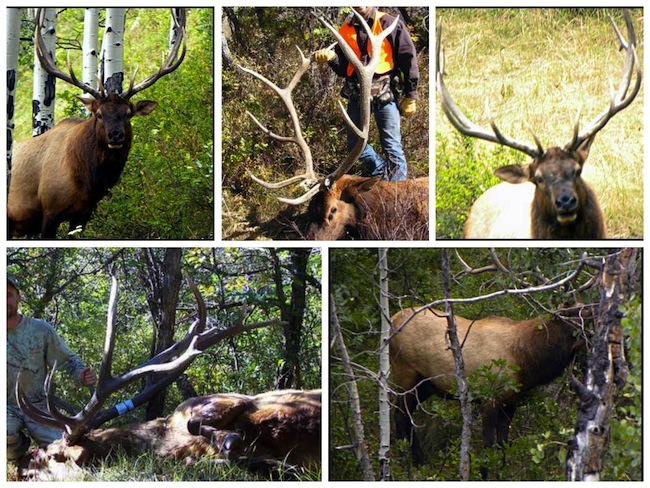 Bulls from the Uncompahgre National Forest, unit 61.
the physical well being to be able to hunt. Christian friends that love God and hunting. a great job that I love, and that allows me this time off. wonderful family and friends that love me, and support me in these hunting trips. my wife. She is amazing and has sacrificed so much for me to be able to go. My Eco Challenge is a personal challenge (by myself; me against the clock). It is in the Maroon-Snowmass Wilderness Area and covers 30 miles, over 4 mountain passes (each one is 12,400 to 12,500 feet in elevation). The low points between each pass range from 9,500 to 10,000. The total elevation gain is 9,000 feet and since it is a loop, the total elevation loss is the same. This personal challenge started as an attempt to complete the 4-pass loop under 24 hours. My first attempt I completed in 12 hours 45 minutes. That led to another attempt, which I completed in 10 hours and 9 minutes. The next attempt was 9 hours and 9 minutes; and my final attempt was 8 hours and 59 minutes. I had to begin this solo challenge at 2am to ensure that I would get over the 4th pass before any storms were to develop in the area. To date, I would say this is the hardest and most challenging thing I have done. My passion is the outdoors and backpacking. In 1997, I quit my job and spent 4 months in Alaska, backpacking, fishing, and hunting. I did 3 fly-in trips where a bush pilot dropped me off in a remote location and returned one week later. My favorite time of year for backpacking is the winter, and after being trained in winter survival, I have done a lot of snow caving and winter hut-to-hut trips as well. I am leaving Thursday October 30 for 3rd Rifle season Elk. I was drawn for a cow tag. I am interested in hearing about your hunt.This will be my first Elk hunt. I am going with a group that has been going to Unit 61 for 8 years. I am so sorry I wasn’t able to get back to you. I hope your hunt still went really well and that you got a cow. How did it go? Glad you drew a bull tag in unit 61. Email me at dustinhardage@gmail.com and I will do what I can to help you out. I leave for vacation tomorrow but will return on July 30. I look forward to connecting. love the pics. Thanks for the info as well. Thanks Herb. Appreciate it. It was a great experience. Glad you liked the photos. Sorry I just now got back to you. My two Brothers and I drew GMU 61 this year (2016). We didn’t think we had a chance of being drawn with only 2 PP, but the Lord provided. We have never hunted this unit before, and we are not sure where to hunt, or gain access to good hunting areas. The down size is to draw a premium area with anterless permits. Thought you might be willing to give us some insight about some areas to checkout. We pull a 33′ travel trailer and have atv/utv’s, and don’t know if we can camp in areas close to where we can hunt. Hope you can help. Appreciate whatever info. that you can provide. Thanx in advance, Don D.
Glad to hear you got a tag in unit 61. Send me an email at dustinhardage@gmail.com and I will gladly do what I can to help you out. Four of us are coming for our first ever archery elk hunt in unit 62 in three weeks, very excited. I am having a hard time knowing what to punch in that would show the general area we would be in. Any help . Sure, I’ll help however I can. Get it touch with me via email at dustinhardage@yahoo.com. Looking forward to it.